Next is on my Home screen on my iPhone and iPad. I use the app every day, and I log every expense (whether it's cash or an expense from my bank account) as soon as I can. My perspective of my spending habits has considerably changed since I started using Next, and I'm making more informed decisions thanks to the overview that this app offers and its elegant design combined with astounding ease of use. If you never used Next, adding a new expense brings a panel to choose a category, represented by 27 icons you can rearrange and modify1. While using the URL scheme, you must select a category using a zero-based index, this means that each category has a number, starting with zero, derived from its position on the grid, where 0 is the first icon in the top left of the panel. Pick a category using its position in the grid. One piece of advice related to the aforementioned action, leaving the note prompt empty crashes the app without adding the expense. Since the parameter is optional, you may want to omit it from the action entirely although you may find it wiser to specify your expenses beyond categories2. Looking for the quickest input, I suggest you dedicate a whole group on Launch Center Pro for expense actions, which gives you 14 slots on the iPhone 5s and 19 on the iPad Air. Consider using one of those slots for the reminiscent categories, selectable through a [list] prompt. 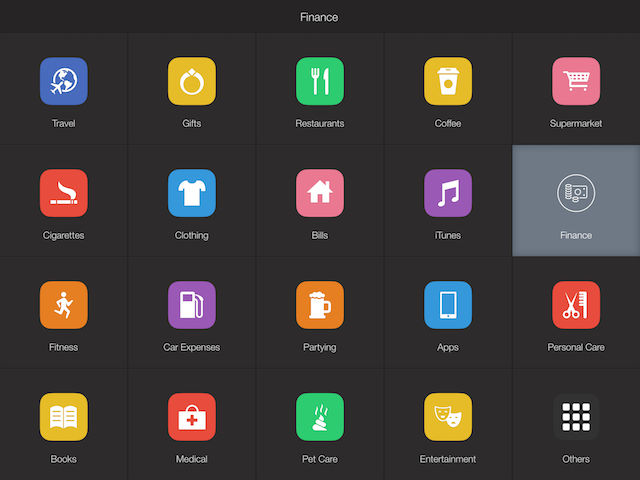 Configure a grid in Launch Center Pro to pick categories quickly. For better inputs with minimal effort, we could put Workflow for good use and search for local businesses in our surroundings to increment our notes — and avoid the blank note parameter. You can still trigger everything from Launch Center Pro and send the category as an user input. Consider that your first category is for supermarket groceries, leaving it as index 0, along with it we'll also send the supermarket query to Workflow, thereafter, when it looks for local businesses nearby, it knows what to look for. We create a single workflow to handle the parameters, first we Split Text and Set to Variable, it will become a list where the first item is the category index, which we set as another variable. The last item is the search term, on which we do a Search Local Businesses step and Choose from List to pick where you're at — it can only be so much accurate after all. If you add your expenses on the spot, you can improve the output with your location or Get Addresses from Input on the result among the local businesses. You can download this example here, tweak as it fits your needs. Using locations to detail your expenses is a practical way to avoid typing whenever you spend some cash and helps to create the habit to track finances, which may be strenuous for some. Another example is the tip calculator you can find in the Workflow Gallery, it adds 18% on a given amount and alerts you with the value, we can extend it with our location as a note and send the expense to Next directly using this workflow — considering that your category for restaurants is the second on the grid, therefore, index number 1. We build several actions that improve our lives slightly but don't help us overcome day-to-day challenges, they quench our urge for automation. As my mom says, The more you earn, the more you spend, maintaining your finances on the leash is a good practice for everyone and I can only say one thing for certain, if you think you can manage your expenses with nothing but your memory, you're overloading your mind with stuff. If this all feels troublesome to you, give Next a spin before you check a more complex system like YNAB.